The extremely popular TV show Cheers was inspired by a neighborhood bar and restaurant in Boston, the former Bull & Finch Pub. The facade of the building was used in the opening sequence of the TV show. 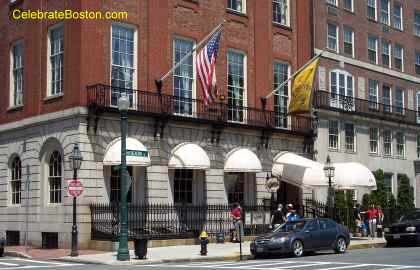 The Bull & Finch was eventually re-named Cheers Boston Beacon Hill due to the great notoriety from the TV series. A second location was opened in 2001, Cheers Boston Faneuil Hall, which is a replica of the interior of the bar in the TV show. Cheers Boston Beacon Hill is located on Beacon Street, just down the hill from the State House. Across the street is the Public Garden, where the Swan Boats operate in the lagoon during summer. On the Arlington Street side of the Public Garden is Newbury Street, an upscale shopping area that is very nice to stroll on cool summer evenings before dusk. The Fielder Footbridge to the Charles River Esplanade is located one block west at Beacon Street and Mugar Way. The Esplanade is the home to the Hatch Shell, a venue for free summer concerts and movies during summer time. Cheers ran for 11 prime-time seasons beginning in 1982. Its popularity has made the Cheers restaurant/bars huge tourist attractions. Both locations have souvenir shops for those who might want to purchase memorabilia. Cheers is a registered trademark of Paramount Pictures. Walking Directions: Exit the station. Walk north up Arlington Street and the Public Garden Park will be on your right. At the other end of the Public Garden, take a right onto Beacon Street and walk one block east. Cheers Beacon Hill is across the street.